John Coleman: Beginning his career as a street level undercover agent in New York City, Mr. Coleman climbed the regional ranks until joining the newly created Drug Enforcement Administration (DEA). Serving the DEA for 32 years, Mr. Coleman for a time occupied the third highest position within the organization, Assistant Administrator for Operations. In addition, he gained extensive executive and policy making experience at the uppermost levels of government service, occupying the highest rank (SES-06) as a Federal Executive Service Senior. Mr. Coleman is currently President of the Board of Directors of Drug Watch International. Jeffrey Donfeld: Mr. Donfeld joined the White House staff in 1969 serving as Staff Assistant to the President. Co-authoring the legislation that created the Special Action Office for Drug Abuse Prevention (SAODAP), he would later become the Assistant Director of SAODAP in 1971. 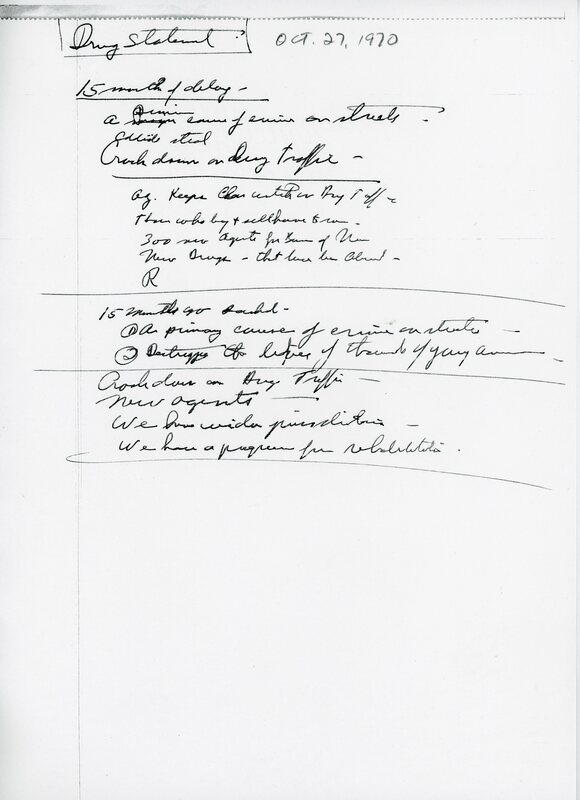 Mr. Donfeld then became the Director of the Office of Hearings and Appeals in the Department of Interior. Returning to Los Angeles, he became a founding partner for the firm Donfeld, Kelley & Rollman, where he currently practices law in various capacities. Dr. Robert DuPont: Earning his M.D. from the Harvard Medical School in 1963, Mr. DuPont began working for the District of Colombia Department of Corrections before transferring to the DC Narcotics Treatment Administration in 1970. 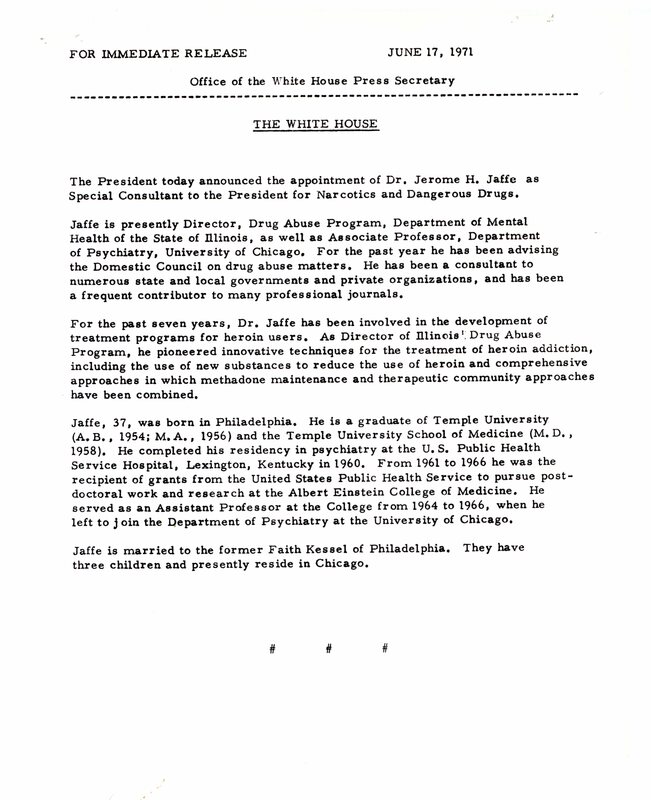 Upon its creation, he became the first Director of the National Institute on Drug Abuse (NIDA) and the second White House Drug Czar. He currently maintains a psychiatric practice in Maryland which focuses on addiction and anxiety disorders. Geoff Shepard (Moderator): Mr. Shepard was a White House Fellow at the U.S. Department of Treasury, and went on to serve as Staff Assistant to President Nixon and then as Associate Director for General Government on the White House Domestic Council. A recently retired lawyer in the insurance industry, he now coordinates the Richard Nixon Legacy Forums, jointly sponsored by the Nixon Foundation and National Archives. Dr. Robert DuPont – “President Nixon’s intense focus on drug policy sprang from several monumental challenges during his administration: 1) the heroin epidemic that produced many overdose deaths and a threatening epidemic of urban crime; 2) an explosion in 1970 of heroin use among American soldiers in Vietnam which threated troop function and public support for the war; and, 3) the disruptive increase in marijuana use by Americana youth. 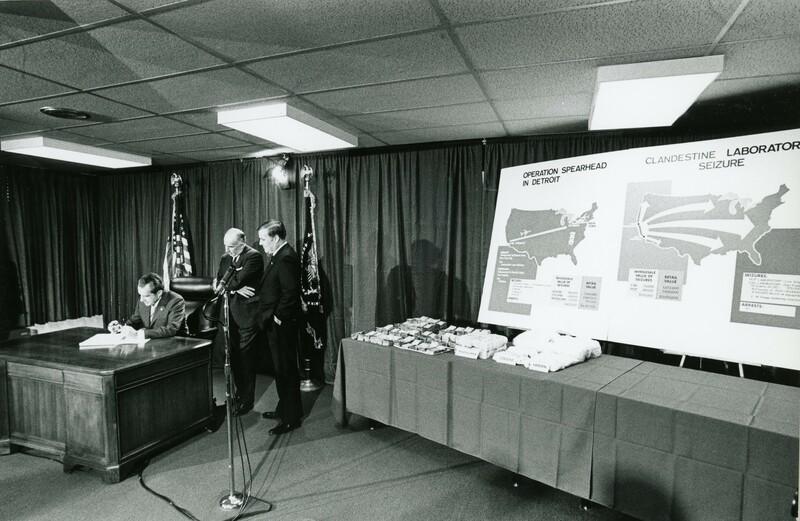 The years 1969 to 1974 – the Nixon presidency – were pivotal for American drug policy. 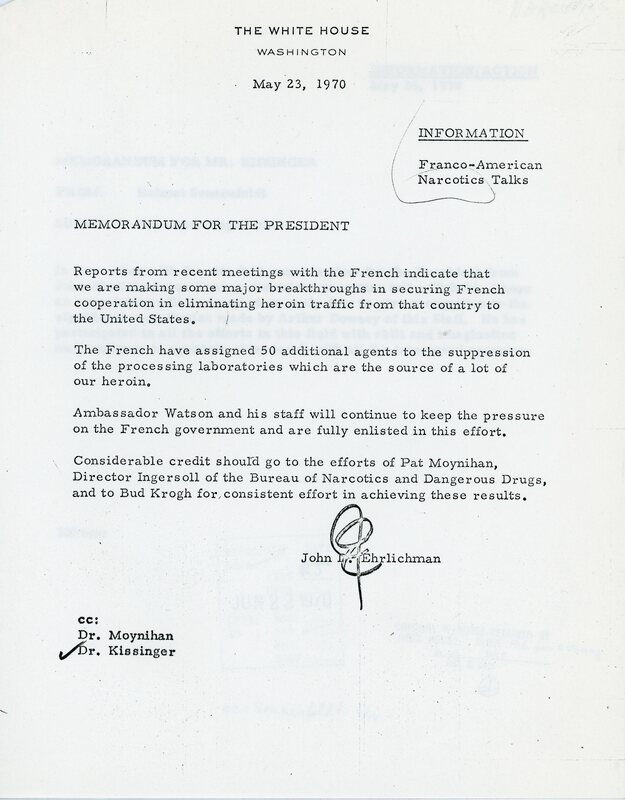 Nixon elevated anti-drug efforts to the top of his Presidential agenda. He focused on the supply of heroin in particular. 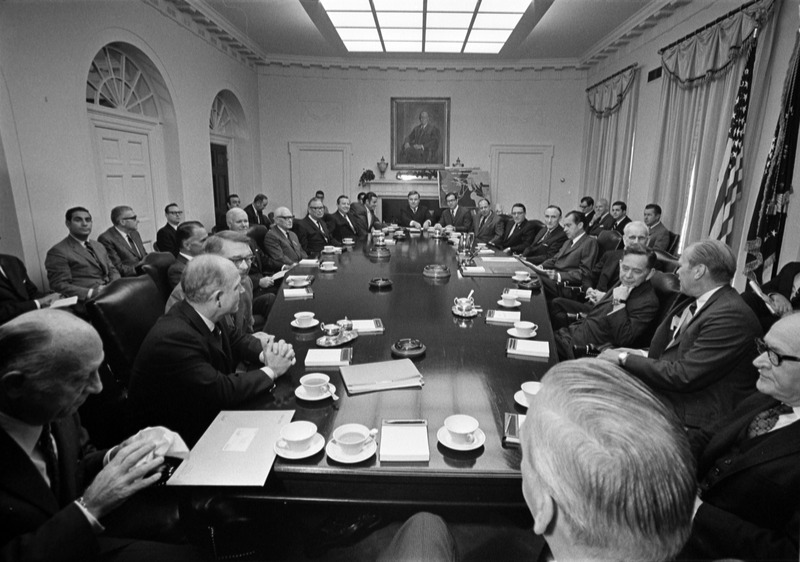 President Nixon hosts a meeting in the Cabinet Room with bipartisan Congressional leadership to discuss narcotics control and treatment issues (10/23/1969). 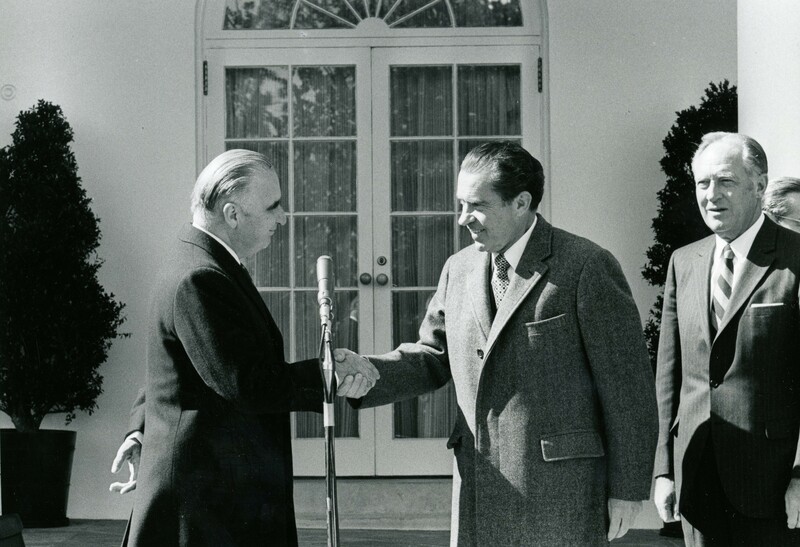 President Nixon shaking hands with French President Georges Pompidou at the steps of the White House Rose Garden, with Secretary of State William Rogers looking on (2/26/1970). 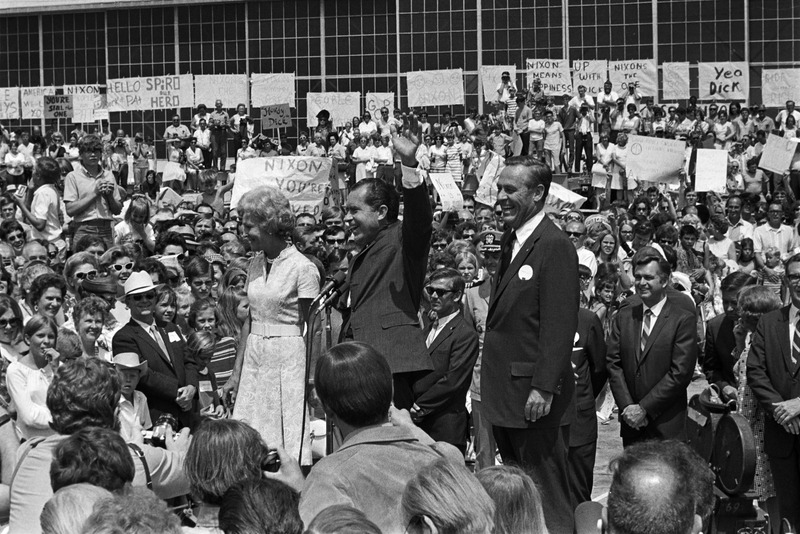 President and Mrs. Nixon greeting the crowd in Denver as they share the stage with law enforcement officials (8/3/1970). 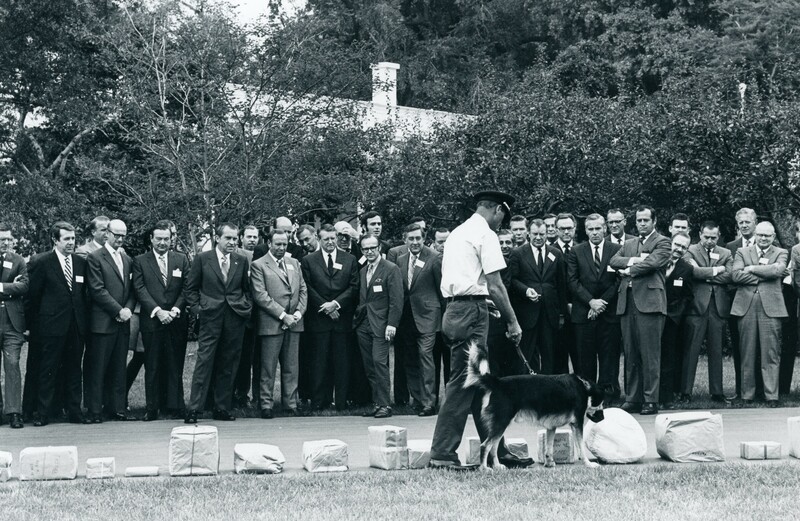 Drug sniffing police dog performs narcotic search demonstrations on the South Grounds of the White House during a conference on drug abuse. President Nixon and actor Gene Autry watch alongside other observers (10/14/1970). President Nixon signing the Comprehensive Drug Abuse, Prevention and Control Act of 1970 at the Department of Justice, while Attorney General John Mitchell and BNDD Director John Ingersoll look on (10/27/1970). 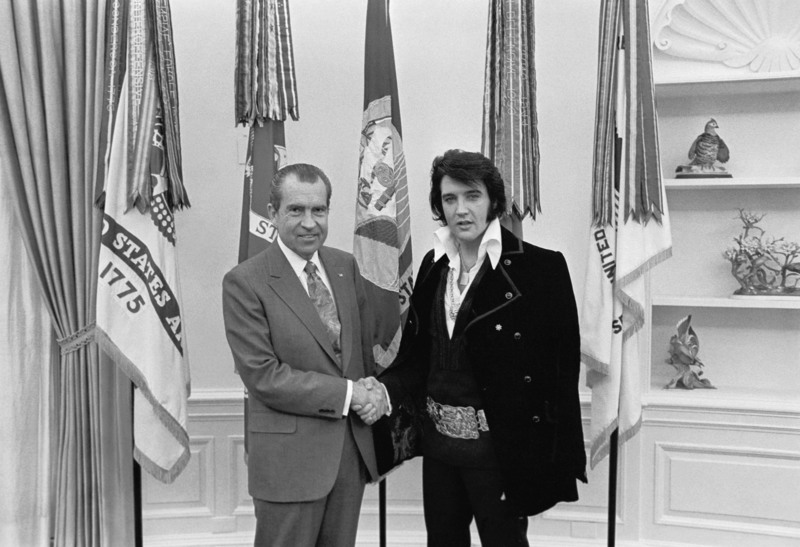 President Nixon and Elvis Presley shaking hands in the Oval Office (12/21/1970). 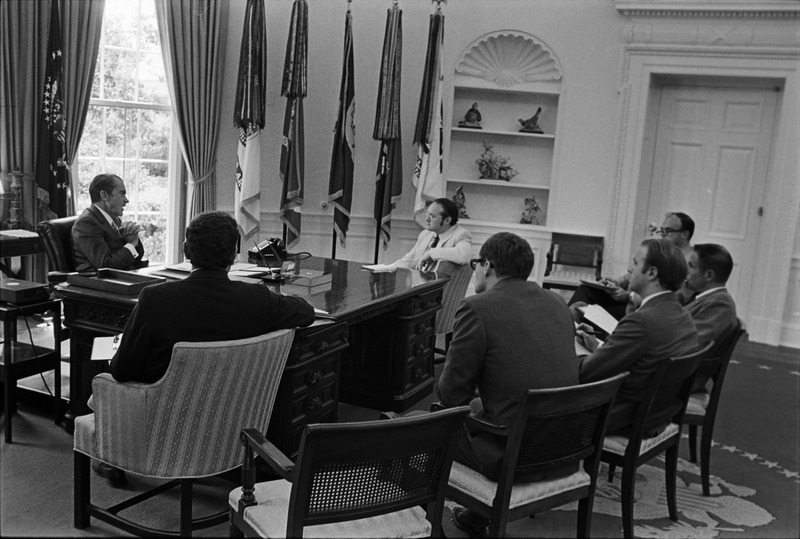 President Nixon hosts Oval Office meeting to discuss the methadone maintenance treatment initiative and the formation of SAODAP (6/10/1971). 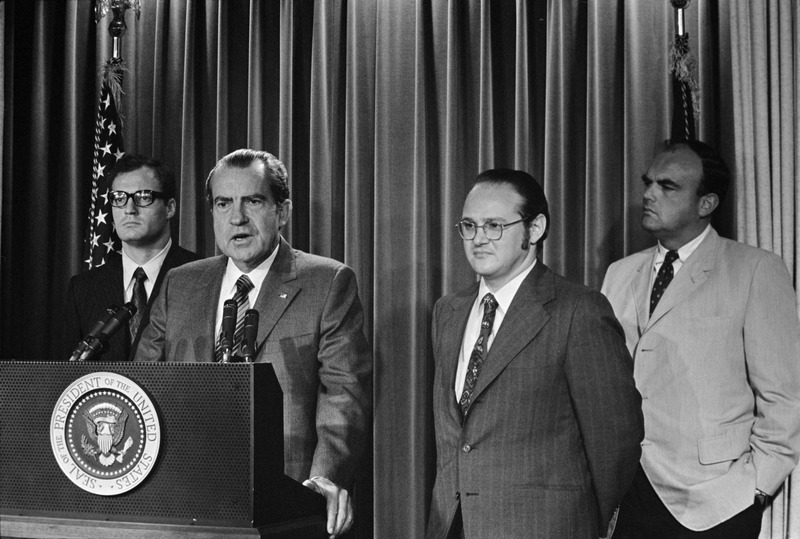 Clockwise: President Nixon, Jerry Jaffe, John Ehrlichman, Bob Haldeman, Jeff Donfeld, Bud Krogh and Arnold Weber. President Nixon in the Press Briefing Room, announcing his appointment of Jerry Jaffe as the Director of SAODAP (6/17/1971). 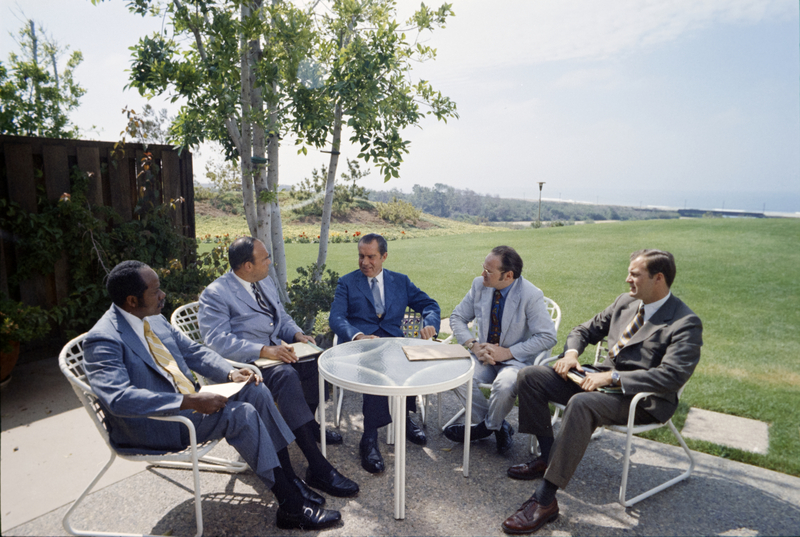 President Nixon confers with his drug treatment officials, at the Western White House in San Clemente, upon their return from South Vietnam (7/17/1971). 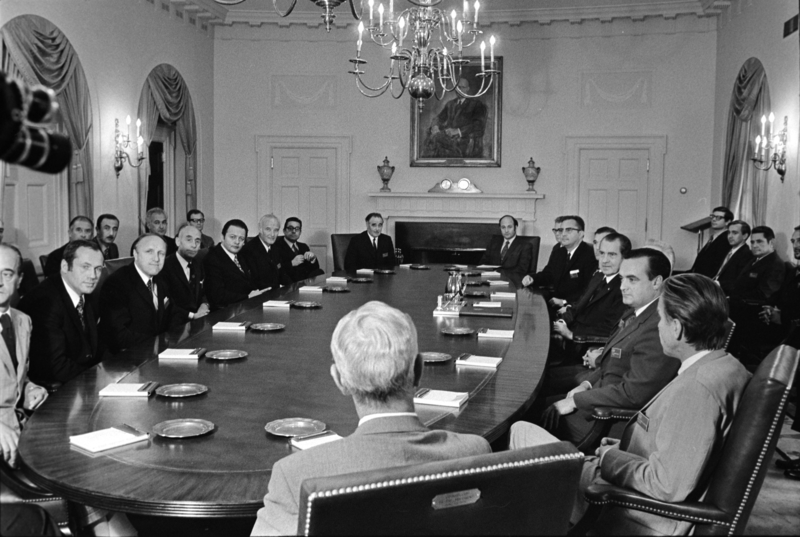 President Nixon meeting with the International Seminar on Illicit Drug Traffic and Abuse (9/21/1971). 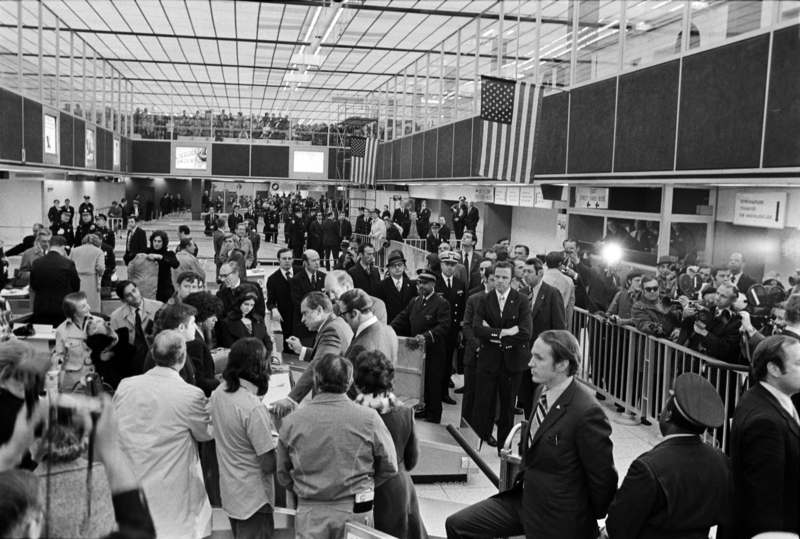 President Nixon and Myles Ambrose, newly appointed Director of ODALE, meeting with Customs officials to review drug detection facilities at Kennedy International Airport in New York City (3/20/1972). 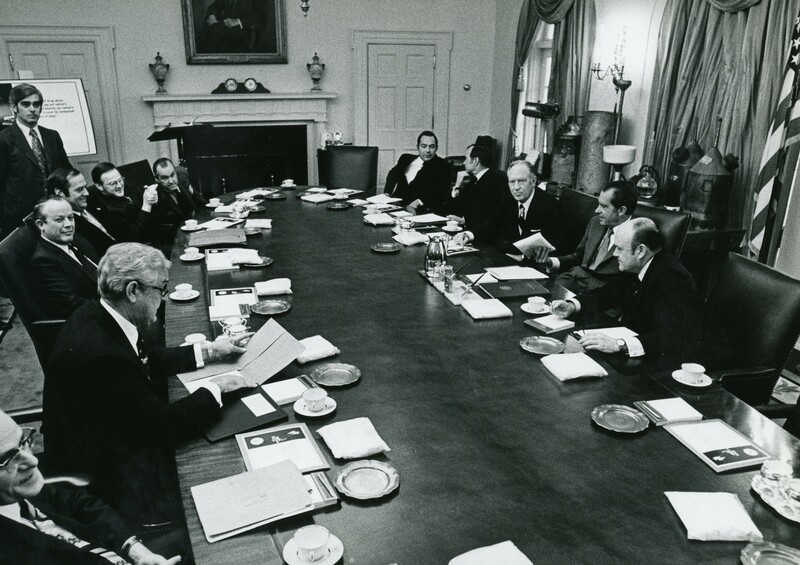 President Nixon joins the Cabinet Committee on International Narcotics Control in the Cabinet Room. Recently seized heroin processing lab and bags of 98% pure heroin are on display (3/20/1972). 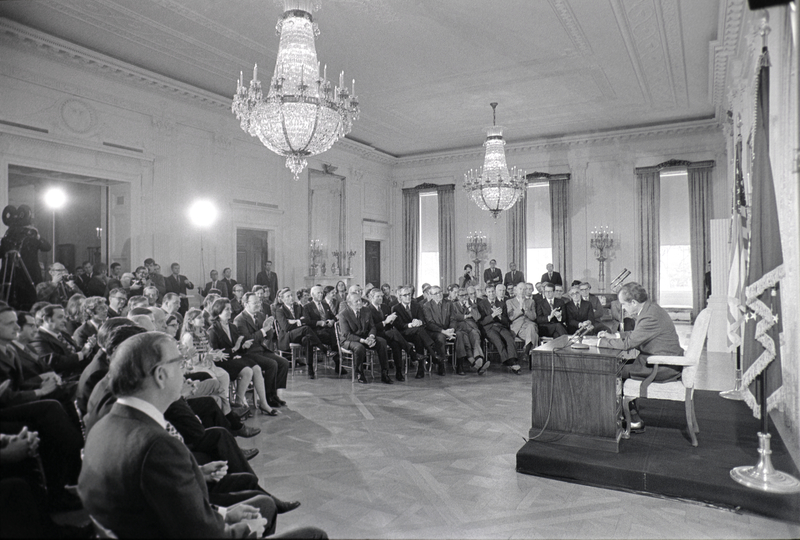 President Nixon signs the Drug Abuse Office and Treatment Act of 1972 in the East Room, which created SAODAP. 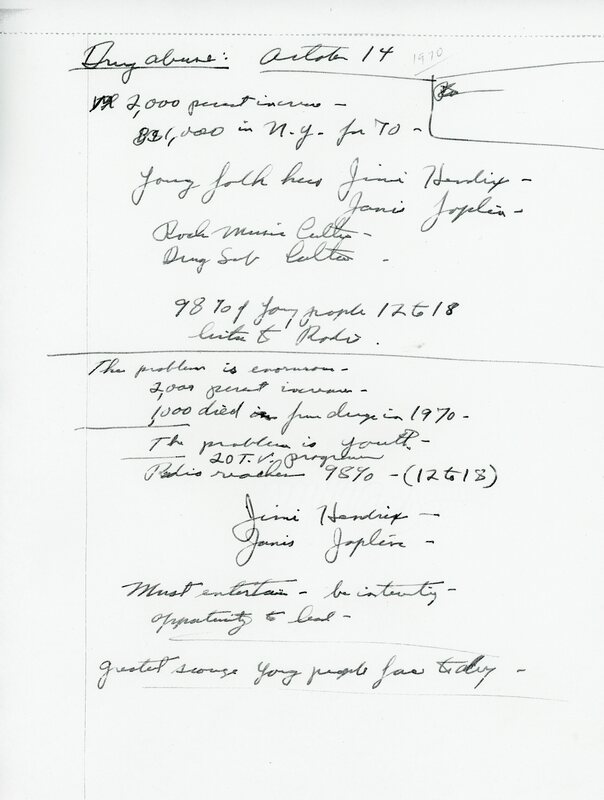 It passed Congress without a single dissenting vote (3/21/1972). 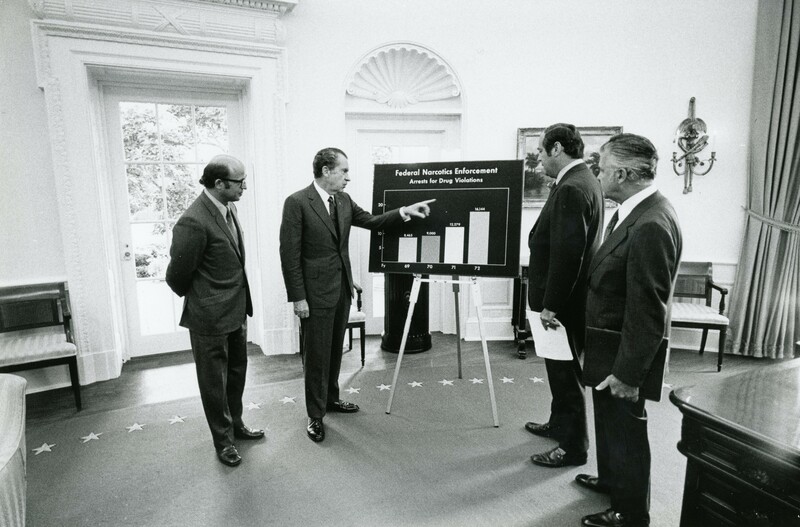 President Nixon in the Oval Office reviewing a chart that displays narcotic arrests statistics with law enforcement officials (7/24/1972). 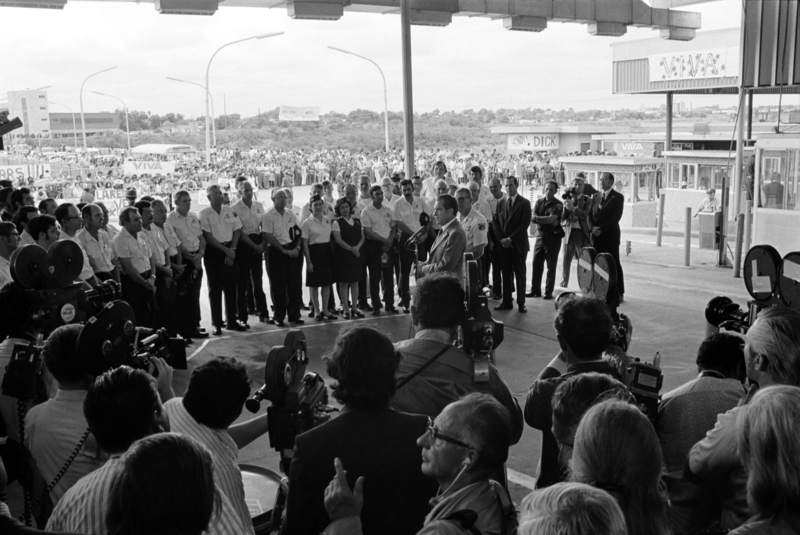 President Nixon addresses Customs agents operating near the U.S.-Mexico border in Laredo, Texas (9/22/1972). 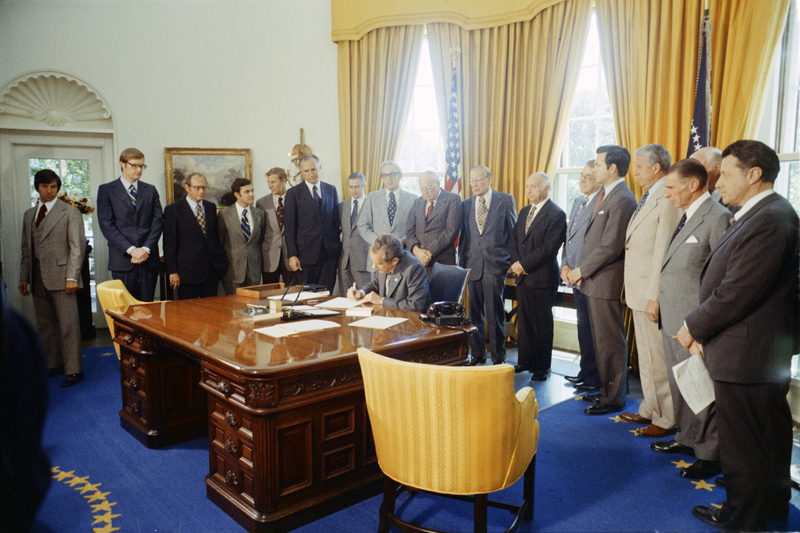 President Nixon signs the Narcotic Addict Treatment Act of 1974 and the Comprehensive Alcohol Abuse and Alcoholism Treatment Act of 1974 in the Oval Office (5/14/1974).